They’ve allowed me to continue with my regular life four provinces away, knowing that my parents are in good hands. Jen, Mrs. Palmer, April & Mr. Palmer after the unveiling of their new home. I can’t say enough good things about this caring and kind business. They are wonderful. The move was super smooth and easy. April and her team were efficient and even returned an envelope of cash that had dropped out of my father’s desk containing several hundred dollars, so we know they are trustworthy. They set up my parents’ new home in a most excellent manner. April and her team were helpful in reducing my stress of moving them out of their home of 34 years. April is doing a very good job of visiting my parents twice a week in the retirement home and attending to their needs, like finding mom a warm sweater, walking with dad to run errands and taking excellent notes at medical appointments. My father’s doctor even commented on how good her notes were and it keeps me up to date with his medical issues. Talia has been very good at calling me when something major is up (like a cancer scare for my dad) to help de-stress and clearly explain things to me. Thank God for ECT. I honestly don’t know what I’d do without them. They’ve allowed me to continue with my regular life 4 provinces away, knowing that my parents are in good hands. Almost like family. I know they’ll be with us to the very end. The costs of the move and the ongoing care management is worth every penny! Talia and her team quickly understood and took upon themselves to handle all aspects of our move. They were flexible, efficient, good humoured and worked quickly to stay within their estimate. They were wonderful to work with and we highly recommend them. This has been a difficult time for us and your people were a godsend. The service was excellent. April and the whole staff were so helpful, we just left things in their hands and a large issue became a non-issue. This has been a difficult time for us and your people were a godsend. The setup at my sister’s accommodation in Briton House is stunning and I know that she will be more than happy. ... being happy with her new home has been key to her feeling positive about her move. Elder Care Transitions moved my Mother from her Toronto Apartment to a Retirement Residence. April & the team helped my Mother decide how much furniture to take, what would fit in her new floor plan design, and packed up everything for us. The team worked with my Mum to set up her new unit, delivered the remaining contents of her apartment to various family members' homes, and then made sure everything else was donated to charity or disposed of. April and her team were friendly, respectful, calm, flexible and kind. My Mum was thrilled with the way her new place was put together and being happy with her new home has been key to her feeling positive about her move. I highly recommend Elder Care Transitions. The stress left her immediately and she felt completely at home. My mom was understandably not sure of what to do; but with your guidance, your staff's efficiency and most importantly their kindness, the move was seamless. My mom's face, when she walked in, was priceless. The stress left her immediately and she felt completely at home. We are so glad we chose to go with your company. There will be things she realizes she may need in the next days, but tonight she can relax in her new home and sleep in her bed. It is a huge transition for her but this first step was so positive because of you and your staff. The service was tremendous with wonderful communication. Talia, April and the rest of the ECT team did an excellent job over a long period of time, first helping our family move our mother rather suddenly from rehab into her retirement home suite, and then later organizing the shipping of large objects to two different cities, and conducting the estate sale and huge clear-out of our parents' large home where they lived for 51 years. The service was tremendous with wonderful communication (in person, on the phone, and via many, many e-mails). 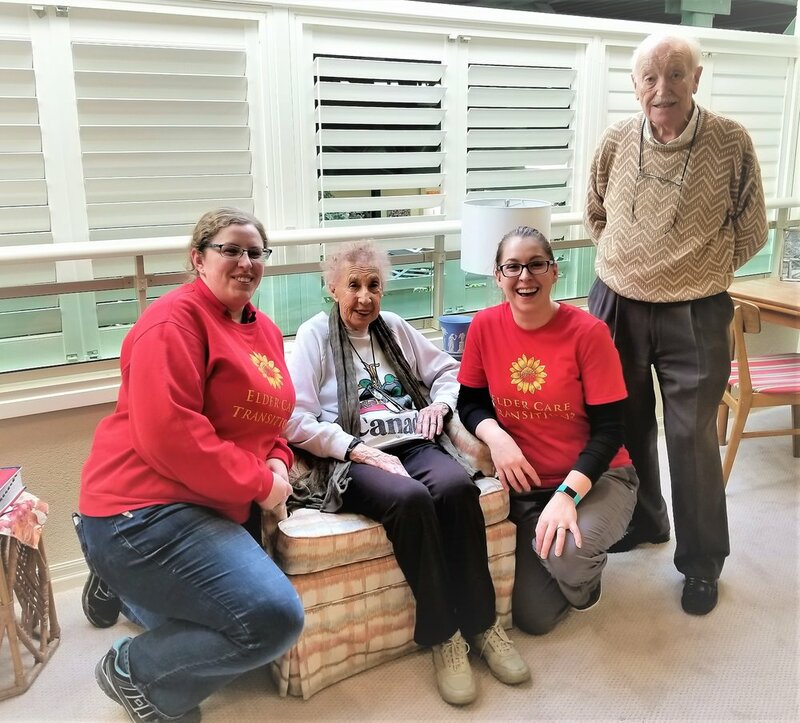 Talia and April are both very kind and respectful, and they exuded a most helpful and calming demeanor all throughout the complicated and difficult transition of our parents moving due to sudden illness from their beloved house into their retirement home. It was a very big job very well done! I will recommend ECT to everyone I know. WAY more than just a moving company! The move was quick and easy - then the problems started, culminating with a trip to Emergency for a 'heart attack'. Through it all Talia was a life saver, reassuring us this was normal, then instantly arranging for in-house care and a companion to take the pressure (and crazy texts) away from us and into the hands of professionals. Now we enjoy visits with Mom, without feeling like we have to be front line caregivers who are on call 24/7.Without ECT to guide us through the entire process, we would have been lost. WAY more than just a moving company! Thank you for a very professional job, moving everything in one day. A seamless result that made it so much easier for my mum (and me too!). Thank you to Talia and her talented team. Vera and her daughter Dr.Lynn Tomkins with April after her new suite is setup and ready to be lived in! If you are looking for help to move a loved one ... look no more!! Elder Care Transitions does it all with professionalism, enthusiasm, and above all with kindness. Our initial phone call with Talia Khanania (Founder/Owner) was like talking to an old friend ... and everything from there was an absolute breeze! April Demers (Senior Move Coordinator) & Jen DeWolfe (Move Coordinator) did all the packing, the heavy lifting, the moving, the unpacking and then surprised us at the end of our moving day with the BIG REVEAL !! Every piece of furniture in place, pictures & personal items beautifully displayed, clothes hung, bed made, bathroom ready for that first bath or shower and TV and phone all in operating mode. How comforting to walk into a new space only to find you are home! Thank you for helping us move my aunt ... your compassion for her well being throughout the process was truly touching. Elder Care Transitions truly are the "transition experts" !! “Enormous thanks for helping us move our mother and taking such good care of us during a difficult time. E. Shiriff, so happy to see her new suite at the Briton House for the first time. "All cheerful efficient and knowledgeable." There is so much negativism these days that it was a pleasure to deal with you, April and your team--all cheerful efficient and knowledgeable. I could not have managed the move and its complications on my own and I will recommend your services to everyone I can. I look forward to seeing you and April from time to time at Walden. I always enjoy our little chats. The Mr. Stark. What a pleasure to help with this move to Walden Circle! "Were fabulous at putting Mom at ease..."
Elder Care Transitions assisted us with two moves for our Mom. The first was from her home of many years into a retirement residence and the second from suite to suite within the residence. I cannot say enough about the professionalism and compassion of this team. Mom was understandably apprehensive and quite agitated about the moves, particularly because she was concerned about her beloved cat. April, Jen and the team were fabulous at putting Mom at ease. They didn’t just focus on accomplishing the physical move, they took pains to make sure she was cared for in the process. When they were done, the furniture was in place, pictures hung, TV installed and the cat was happy. Mom was also happy! From our perspective, the two moves could not have been accomplished more smoothly. We would highly recommend Elder Care Transitions. "There aren’t enough words to express my heartfelt thanks..."
There aren’t enough words to express my heartfelt thanks to you and your “girls” (April and Jen) for the successful and very happy move for me to my new abode. The professionalism and tender care you gave to me and my belongings was wonderful and I am now enjoying settling into my new surroundings. I particularly enjoyed getting to know you all. Your humour and helpful suggestions along the way proved to make it so much easier for me to adjust to leaving my long-time home and turning it into a new adventure. I most heartily recommend your company to any and everyone who is planning on downsizing. It doesn’t come better than with Elder Care. I wish you continued success, Talia. Loretta Robertson on Move Day. Such a sweet and energetic lady! "I would recommend your services to anyone.."
I was very impressed with you, your moving specialists and the service you provided. Stephanie and April were friendly, efficient, informative, and fun to be around. They worked very hard the day before moving and the actual moving day. They did not waste one second, and BEST OF ALL, they kept smiling all day. They made a stressful time a memorable, happy time. Your concern and information before the move was inspiring and gave me more confidence and relaxation than Valium! I would recommend your services to anyone - the first interview was pleasant and reassuring, and the pre-moving day awesome. The day of the move was smooth and all my belongings were in place immediately. venture. All the best in the future, and I will look forward to seeing you again. "You can't believe how fortunate I felt to have found you and for your expertise in helping us find the perfect retirement home for Mom. Thank you so much for everything!" The great reveal at the end of move day with Mrs. Wortsman in her lovely new suite! "My Aunt Jean's blood pressure has been going down for the first time in 25 years - amazing eh!!!!! I think she is experiencing a lot less STRESS these days !!! Proves the move and living at the retirement community you helped us find for her has been the best thing for her !!!" "Everything I was looking for and needed at that time.."
"A wonderful young woman came to my home to see me and was kind, caring, supportive, understanding, patient and knowledgeable...........everything I was looking for and needed at that time. She did indeed help me find a wonderful new home in a lovely retirement residence in downtown Hamilton. There is no doubt in my mind that I would not have been able to find this special new home without Talia's aid and assistance. Thank you!" Did we make change easy? an elderly client under my care. Whether it's arranging a social outing, purchasing a new orthopaedic bed, or organizing a move, Talia of ECT has always provided exceptional, caring, and trustworthy service. I would highly recommend ECT for any task involving an elderly loved one." Mr.Begemann after we have come by to check in on him and Mrs.Begemann post move. to my new home. I received answers I needed quickly, and you responded to my every need. Thank you for all your kind help. Sincerely, Ms. Kettle." "Recently, I've changed my residence from one apartment to another within a retirement facility. The move was made in my absence while I was away on holiday under the direction of Elder Care Transitions. My furniture and all fragile belongings were carefully handled, and set up in my new apartment exactly as I had them in my old apartment. Talia was wonderfully patient through the entire process. I should be pleased to recommend Elder Care Transitions to anyone requiring similar help. Wally"
"Dear Talia, You were so helpful! As you know my move was very stressful for me. Your expertise in the coordination of every detail was excellent removing so much of my anxiety. I'm so fortunate to have had someone like you, help me through the transition. Thank you so much! Sincerely, Barbara Fletcher"
"Dear Talia, We are so appreciative of how you have helped us out during a difficult time. Thanks so much - you have been extremely professional and trustworthy through this entire process. We will certainly pass your name along to anyone we know needing assistance. Thanks again, Sheila"